I know i said i wouldn't post anything just yet but i have cropped this piccy down a bit. this is a chap we met out whilst walking today. 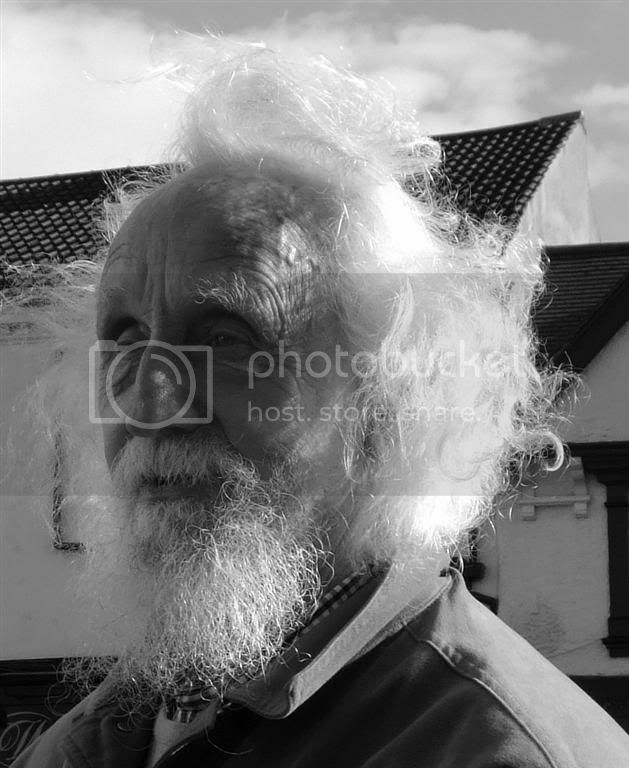 a real eccentric chap with all sorts of stories to tell. he also had 2 yappy dogs. i would have liked to have taken more but i felt a bit uncomfortable even though he did say it was ok to take some photos of him. i know it is a bad background etc but i was sitting on a bench and just clicked a couple of shots off!! I love how his hair is so windblown. It makes him look more eccentric. You did a great job capturing him!!! Keep showing us more of your photos. You are very kind!! i will get braver i am sure! he kind of has that Albert Einstein, disheavled look to him. Sharon that would be good if you had a fiddle with it!! i might too. if i knew him i would have been taking all kinds of shots with all sorts of settings but it was a bit cheeky really so i just took a couple. i am still getting used to the camera as i only got it this week. i had a little point and click thing before and i always had it on automatic. this is all new to me fiddling with the settings. i wont be offended with any comments, far from it, i really want some help and ideas!!! by the way, my husband is from Stirling!! i havent shot in RAW before. what sort of things can you do in RAW that you cant do in Jpeg? This is an exceptional image for someone who is a beginner. I love his hair and his characterful face. Keep up with this sort of quality and you will do just fine. Well done Fee! There is so much cheractor in his face! I love his hair...this is a very nice capture. I want to know this man! Nice help Sharon! What a character Fee, you are so brave asking to take his photo, I am still not game for this. This is a great start with your new camera. also, i dont seem to have access to emoticons on here, is that correct or is something amiss? I'm sure she will sort it for you. You a Blonde by any chance?? After all the thrashings I have had lately my arse really is this colour now.